Watchman Nee’s books, especially the first few chapters of his crowning achievement, The Spiritual Man, as well as the brief but excellent Release of the Spirit, have informed the majority of my thoughts on this topic, and both books should be required reading. The role of the body in the spiritual life is not much discussed in Christian circles, for two reasons. The first is that fundamentalism, which emphasizes our sinfulness, but not our divine nature (made in God’s image), focuses on sin and the “lusts of the flesh,”, confusing the use of the word “flesh” in scripture, thinking that the body is “bad.” Secondly, Christianity is mainly focused on revealed truth, and therefore focuses on hearing God and intellectual study. The eastern religions, by comparison, focus on empirical truth, and try to learn about the divine through the experiences of the body and soul. Practitioners of yoga and sitting meditation know much more about how to integrate the body into spiritual practice than Christians do. But that’s another essay. With this as an outline, I will follow up with a breakout of each. Seeker… I know that you believe in a soul, and a spirit, and whatever, but as a former would-be-biologist it seems strange that you'd entirely reject the idea of physical causes of consciousness. Do you really believe that our brains aren't chemically responsible for our thoughts? If I humor your theory for a moment, why do you draw a distinction between "spirit" and "soul". What's the difference? You think that there is a fundamental difference between conscience and intellect? I think you're just pulling stuff our of your nose, at this point, because it sounds deep. It's not deep, though. It's very shallow, actually. It's not reality at all. Our brains are the center of our intellect and conscience, and even the limited amount of knowledge we have about neurology and cognitive sciences makes that pretty clear. Why would you think otherwise? What the heck do you suppose those brains are doing up there, if the "soul" is doing all the heavy lifting? And why do we have such trouble thinking when bits of our brain are damaged? Seems like a weird coincidence, doesn't it? Scripturally speaking, the soul is not the same as the spirit. The conscience, as I will explain, is actually on the interface between soul and spirit. But that's my construct. There are good reasons to differentiate between the two. Sure, biology plays into the soul. But this symbolic construct, like any others, is an oversimplification so that we can address the various functions of man, and how they are affected or changed. You should check out Nee's Release of the Spirit – it is short, and covers these. The soul is in the body. While the brain may be the seat of consciousness, the rest of the body is integrated with it, and affects and is affected by the brain. I'd say you could get a heart transplant without affecting your personality or soul directly, and that the brain probably houses most of what we consider consciousness. But the "heart" is somehow physiologically involved, as is the rest of the body. Seeker, Rene Descartes called: He wants his false dichotomy of body/soul back. Maybe you could come up with your own broken theory of human existence, instead. Are you serious? Read that sentence as objectively as you can, and tell me that it makes any sense at all. What are you basing this on? 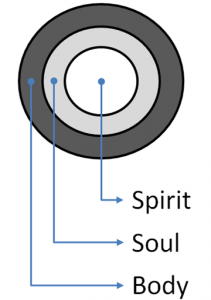 “The interface of the soul?” None of these things exist. Your brain houses all of your conscious and unconscious mental functions. There’s absolutely zero reason to believe anything else, except for your already-demonstrated propensity to believe some very old, very silly theories that have no basis in reality. Listen, the tripartite model of man is both well established as a practical doctrine, and if you give me time to explain what I can, I will. If you are really curious, you can check out the books I mentioned, or the link I provided to the first few chapters of The Spiritual Man. However, my speculation about the funcitons of the body are not established, but just a musing of mine. I can skip that, no problem. I should spend some time reiterating Nee's excellent discourse on the differences between spirit and soul, since there is a lot of confusion, and most people think them synonymous, or that they are too mysterious to yield to analysis and symbolic constructs. But they are not entirely beyond understanding, though there are always some things that remain unknowable in the spiritual realm. As curious as I am about things, I'm afraid I don't have the time to read books about something which I believe is provably false. Still, I'll be happy to read your summaries or explanations here, as long as they're — you know — under 250 pages. You say that this tripartite model is "well established", but what does that mean? The theory of caloric fluid was well established, too, but that didn't make it any less wrong. I can't help but think that these sorts of non-empirical models are based on nothing but wild conjecturer and intuition, and those aren't good foundations for the truth. It's a fine starting place, but you can't rest on it. Your model doesn't sound any more convincing, or have any more evidence than Plato's "Forms", or the theory of spontaneous generation. They sound plausible, but their plausibility is only based on ignorance-of-fact, not actual knowledge. "The Tripartite Makeup of Man"? Louis, you're not serious, are you? Again, this is a theological model. That doesn't mean that it can't be verified by science, but it does mean that it has it's root in the bible, not science. However, as models go, I hope to discuss why it is a good one. It is not the ONLY one that is valid, but it is biblical, and established in the sense that it is well regarded in theological circles. Again, that doesn't make it empirically true, but it is a useful model for explaining some very important Christian ideas, which I will try to get to. It is hard to find time to write, with a full time job, a family, and a wife that works on weekends (real estate). That's why I need to change jobs (to pastor) so I can read and write more as part of my job. I think Louis' example is a good one – not the biblical tripartite model, but another useful three part model used to describe the psyche of man. Now, it may be three part because that is what we can wrap our minds around, or maybe the number three, like many other numbers, appears in nature very often, and our three part models are actually a decent representation of what is. I understand that you're discussing a theological idea, but surely you can accept that this sort of ontology is, in reality, an objective concept; it's either true or it isn't. Some objectively false models are still useful. We say that the sun "rises" and "sets", for example. That's a useful way of talking about its motion, but we all know that the sun isn't really rising or setting at all; it goes without saying. Your model might be similarly-intentioned, but it does not go without saying, because you seem to be stating that your three-way division is actually how things are. So I guess we should clarify this: Do you actually believe that there is a tripartite separation of human cognitive, emotional, physical, and spiritual functions? Or are you merely offering it as a useful way of thinking about things? If it's the latter, I don't see any reason to argue with you (since you're not actually saying anything objective), though I'd be curious to know why you thought it was a useful model. But if it's the former, I have to protest, because I think your model is (objectively) untrue. Actually, I don't think it is an either/or, because all three are well integrated. I mean, your chemistry plays into your personality, yet we can talk about them separately. I believe that they are useful because they are a model that describes some real functions, and so in some sense, are describing objective realities. However, if you demand an overly strict division of spirit and soul, you may be asking too much of the model. Needless to say, scripture makes a clear differentiation, and theology helps explain why. And as i will try to explain, this model of man has ramifications on how we approach the healing process of both man and society. Can you be a Christian and not believe in an immortal soul? Probably not, I'd say that's part of what is essential and central – I mean, how could you believe that Jesus died for you, and that there is a coming kingdom if you don't believe in the life to come? I mean, I suppose you could believe that even in the next life you aren't immortal. Well, I was under the impression that the central hope was resurrection into a "kingdom" ruled by Christ. The whole hope springing from his commitment to God, his Father, till the end of his life, and that he was risen, by God, as his reward for faith fullness. But the immortal soul issue, I am a little stuck on. But what is the coming Kingdom? It is both now, spreading in the hearts of those who believe and submit to the King of that Kingdom, AND it is a coming kingdom in which there will be no death, pain, sickness or sorrow, and in which those of us who have received him will inherit ETERNAL life, and to those who disbelieve, eternal torment. will fail to receive a hundred times as much in this present age (homes, brothers, sisters, mothers, children and fields?and with them, persecutions) and in the age to come, eternal life.